Chris Heenan is an American composer / performer and organizer of experimental music. 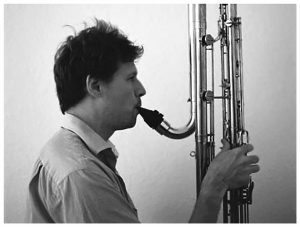 He works with the alto saxophone, contrabass clarinet, and analog synthesizer in contexts ranging from solo to large groups and in various ongoing projects. Some of Heenan’s regular projects include Nordzucker, PIVOT, Trigger, Team Up, Phantom Limb and Bison. He has collaborated with a large number of Berlin-based musicians and is a member of Berlin’s Splitter Orchester. Heenan performs regularly in the U.S. and Europe, featured on such festivals as Improvised and Otherwise (Brooklyn, NY) Experimental Intermedia (New York), Projektgruppe Neue Musik Festival (Bremen), Klub Katarak (Hamburg) Sonic Acts XIV (Amsterdam), Blurred Edges (Hamburg) and at venues such as Artist Space (New York), Radialsystem V (Berlin), The Renaissance Society (Chicago) and The Santa Monica Museum of Art. He has also been active as a curator of musical events and concerts and is the recipient of grants from American Composers Forum, Arts International, The Durfee Foundation, Kulturamt Neukölln, Initiative Neue Musik Berlin e. V., Deutscher Musikrat, and Hauptstadtkulturfonds Berlin.